When I embarked upon this project to find the diverse people of Georgetown and write about them, my husband suggested Barbara Faison. She’s been an old friend of mine for years. I don’t mean old because she’ll be 76 this year, but because I’ve known her almost 30 years. My daughter was barely two when we met therefore, Barbara has always been in my children’s lives and they adore her. My husband suggested her because whenever something happens in Georgetown, he says, “Call Barbara and ask her. She’ll know about it.” Everyone knows Barbara, she’s like the town matriarch. 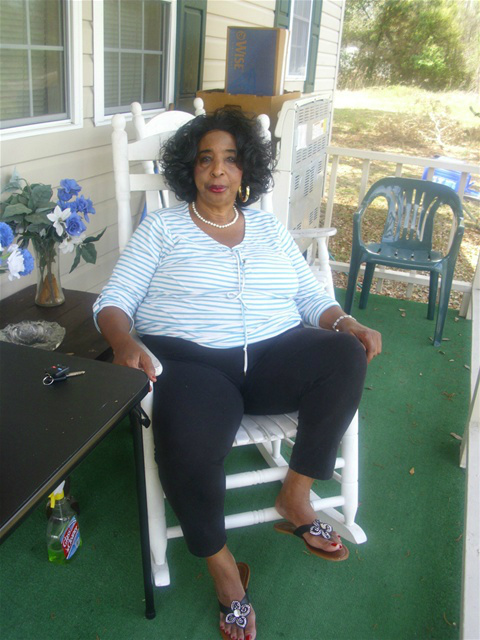 Since she’s a Black-American woman, and 76 years old, I thought we could talk about what it was like for her growing up in the south during a generation of racism and segregation. “I really don’t know much about that,” she said as we sat in her kitchen talking. “What do you mean you don’t know anything about it?” I said cramming a fork-full of her Salisbury steak into my mouth. “You’re a black woman, Barbara. You live in the south. Hell, some people are still fighting the war down here so you have to know something,” I insisted suddenly feeling like a chubby Emma Stone in the movie, The Help. I listened as she talked a little about her childhood. Barbara was one of her father’s 17 children. The captain had two girls and three boys with his first marriage, another son out of wedlock, and five more girls and six more boys with Barbara’s own mother. Along with her many siblings, she had been delivered by a mid-wife as a home-birth, not in a hospital. When asked if it had to do with segregation laws, she couldn’t remember. I suppose I can’t blame her for not remembering her birth. Later, after Barbara had married and had children of her own, she moved to the opposite end of Front Street. She has a vast collection of friends. As I said, everyone knows her. Barbara has four sons and a daughter; Donald, Tina, Marty, Byron and Robbie. In the spirit of care-giving, she’s spent the better part of her younger years as a certified nursing assistant which is how I met her. Barbara taught me hands-on patient care when I went through nursing school. Back when I was studying to be a nurse, we did a rotation in the nursing homes. It was free labor for the nursing home and they capitalized on it forcing the students to work along side of the nursing assistants instead of the nurses. “No? Really? Nothing?” I inquired. I was so sure with that look on her face she was going to tell me something juicy. I was drooling. I sat back in the kitchen chair and patted, my now, very full tummy and reflected over the conversation. I had learned quit a bit about one of my oldest friends, Barbara Faison; many things I never knew. Even without writing this piece on her, I really enjoyed our talk. She’s a wonderful person with a huge heart that seems to have a special beat in it for everyone she meets. I’m sure we’ve all heard the cliché, “I’ve been blessed to be in their lives.” That’s the kind of person Barbara is, you just feel blessed to know her. So much for being a chubby Emma Stone I thought as I closed my notebook. I would have loved to have written something historical. “You know what, Michelle?” Barbara said picking up her phone. “You should talk to my sister, Rebecca Izard. She just turned 100 years old last month.